Interested in spicing up your copy of Ticket to Ride? We have special purple train sets and stations, and one beautiful set of Milk Tankers and Milk Stations that will go to one lucky (or skillful!) competitor! 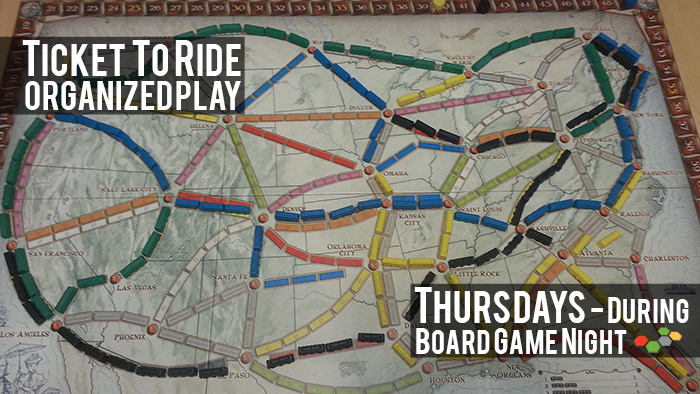 For four weeks, every Thursday during our Board Game Night, we're running a Ticket to Ride contest. It's $3 to buy in, and the top three players each week will receive a complete set of 45 purple trains and three stations to give their own copy of Ticket to Ride a special flair. The winner each week will be recorded, and at the end of the fourth week, the player with the most overall game wins will go home with Milk Tankers set!